For National Coming Out Day, I wanted to write about a movie that is in lien with today’s message. 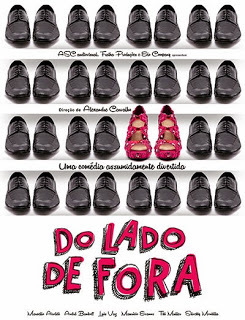 Do Lado De Fora (Boys In Brasil) is a movie from Brasil directed by Alexandre Carvalho, and is the story of four gay men coming to terms with coming out. The movie is book ended by the Sao Paulo Gay Pride Parade, one of the biggest in the world. (The last one had more than five million people in attendance) A group of friends make a pact that by the next pride parade, they would all be out. But of course there are complications. Vicente (Marcello Airoldi) needs to come out at work, as he is pretending he is married to a woman. Roger (Andre Bankoff) is married with a son, and he also finds out his wife is pregnant. Mauro (Luis Vaz) has over religious parents, and wants to be a drag queen. All these complications come to a head, and the story telling is a bit on the lazy side, but I don’t think one is meant to take this film too seriously. (The abrupt reaction of Mauro’s parents in the end is a bit jarring after all the conflict build up) And in this day and age, it seems somewhat dated, though one must take into consideration how Brasil is still a conservative and religious country. But it has a good message: Come Out, Come Out, Come Out, and I hope it inspired some Brasilians to do so.